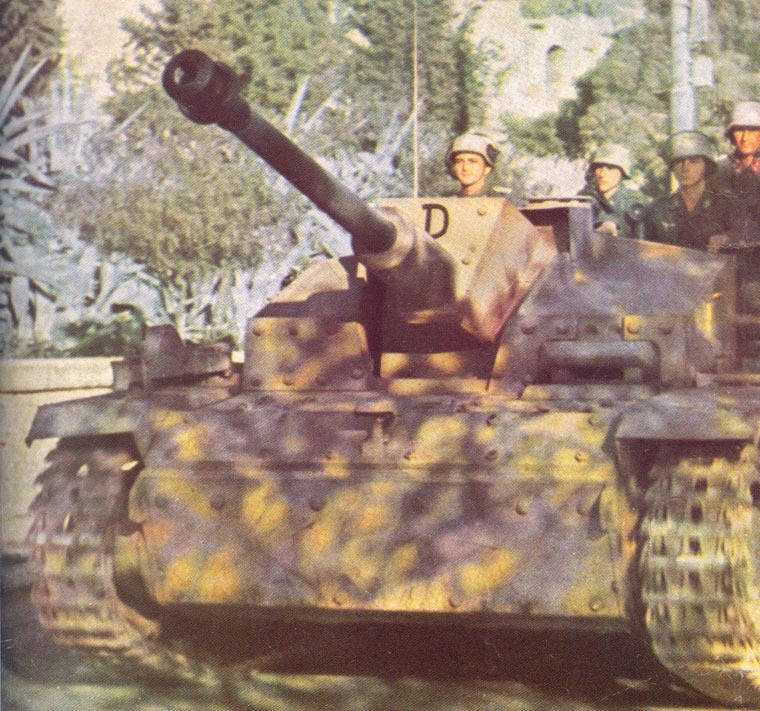 StuG 40 G in Athens during the occupation times. The StuG 40 Ausf G was the last production series of the Sturmgeschutz III. Rolling off the assembly-line in December 1942, the Ausf G was produced until the end of the war, with no major design changes. In 1942, the decision was made to use Panzer 3 chassis for StuG production, since the PzKpfw III was being phased out and replaced by the Panzer V Panther. In response to this request, 165 PzKpfw III Ausf M chassis were used as chassis for StuG 40 Ausf G, with production from February to November 1943. In 1944, 173 PzKpfw III, returned to the factory for overhaul, were converted to StuG 40 Ausf G.
The hull of the Ausf G remained unaltered from the design used for the Sturmgeschutz Ausf F/8. The main design changes were to the superstructure. The roof was altered, and a cupola with periscopes was added for the commander, and a shield for the machine-gun was installed in front of the loader’s hatch. The superstructure sides were now slanted, and slanted plates were added to protect the front of both panniers. Various improvements were instituted during the production run, including introduction of the Saugkopf (sow’s head) gun mantlet late in 1943, the coaxial MG34 machine-gun early in 1944, and the Nahverteidigungswaffe (close-in defence weapon) and remote-control machine-gun to the superstructure roof late in spring 1944. Early production vehicle with additional armour bolted on the front. StuG 40 G with armour side skirts. Late production StuG 40 Ausf G with Saugkopf gun mantlet and remote-control machine gun. StuG attacking Russian AT-gun position. Sturmgeschütz in front of the Acropolis in Athens. Side view StuG 40 Ausf G at Panzermuseum Munster. Vehicles issued to Funklenk Kompanien (Remote-Control Companies for Goliath etc) were fitted with an additional radio aerial on the left front of the fighting compartment roof. Twenty-eight independent Sturmgeschutz detachments, four divisional Sturmgeschutz detachments, two 2nd Funklenk companies and twelve Sturmgeschutz platoons (with Luftwaffe Field Divisions) were at the front in Russia at the start of the Kursk offensive. From the start of the war, the use of the assault-gun spread from Sturmgeschutz detachments to the other types of formations, including Panzer detachments, Panzerjager (tank hunter) detachments and Funklenk companies and detachments. Secondary armament 1 x 7.92mm MG34 or MG42. Additional, from early 1944 1 x 7.92mm MG34 coaxial to gun, from late spring 1944 1 x 7.92mm remote-control MG34 on superstructure. 1940 30 (1.5) 179 ?